On the way to the airport in Bangkok recently, I managed to hail the most interesting taxi. 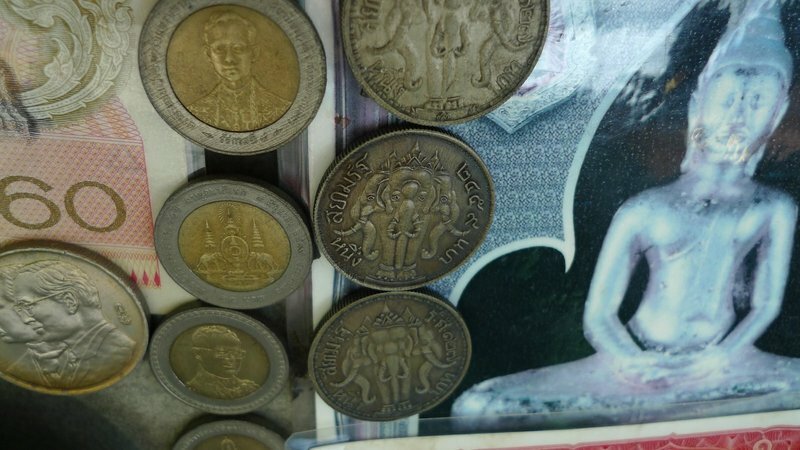 The entire front half of the interior was decorated with coins and currency, almost all of it Thai and most of it commemorative or collectible. 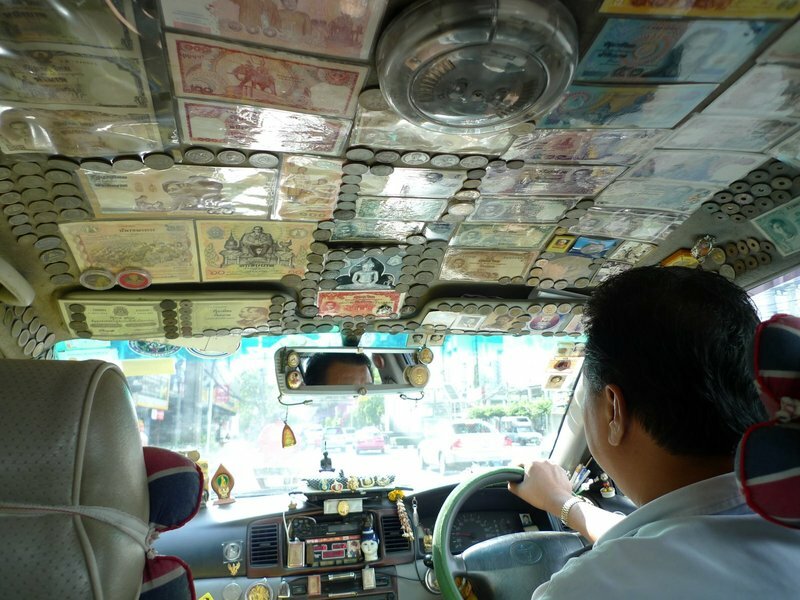 The driver, who has been working on this collection for more than a dozen years, started collecting both out of interest, but also for the “good luck” brought by having the auspicious images of Thai kings posted in his taxi. 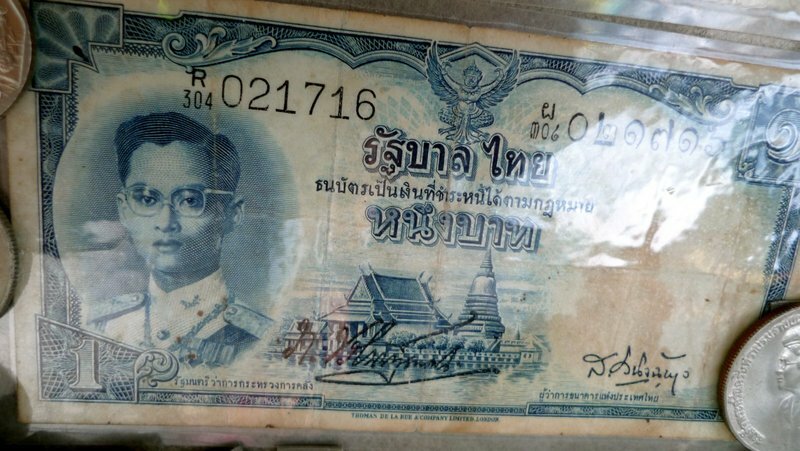 This one-baht note comes from early in the present king’s reign. His Majesty has been the monarch for more than 60 years and these days a baht (current exchange rate, about 30 baht to the US dollar) is just a coin used for change. These early one-baht coins feature the three-headed elephant known as Erawan, borrowed from the Brahmanist traditions associated with the royal court. Even more unusual is this 50-satang note. A satang is 1/100th of a baht. These days we have 25- and 50-satang coins and you only receive those as the result of rounding because of tax. There isn’t anything in Bangkok you could buy for 25 satang. 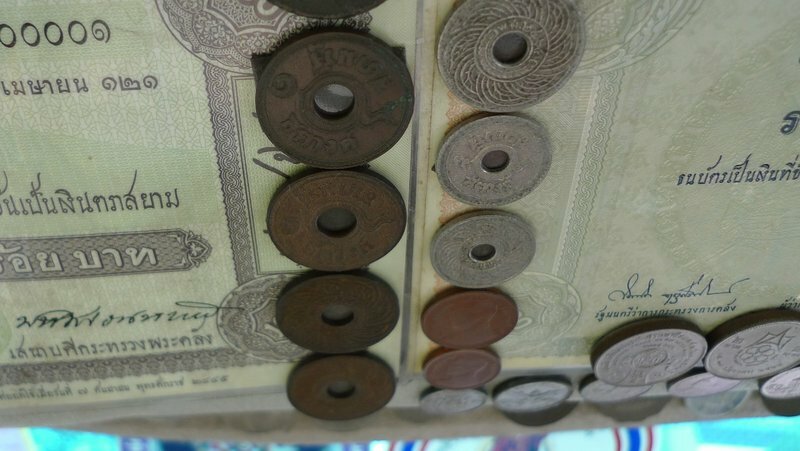 Talking about small amounts, these extremely old coins, with holes in them, are one-satang coins (1/100th of a baht). They were introduced in 1908, near the end of the reign of King Chulalongkorn, known as Rama V. The current king is Rama IX. One satang!? I wonder what that bought back in the day? While it is common to see taxi drivers decorate their dash boards, particularly with items they think will bring them good luck, I don’t recall ever seeing so extensive and interesting a collection. This entry was posted in Uncategorized and tagged Coin, culture, currency, Money, Thailand by christao408. Bookmark the permalink. Interesting, indeed! I like the way he lined them up. That’s pretty cool! Hope no one tries to rob him! 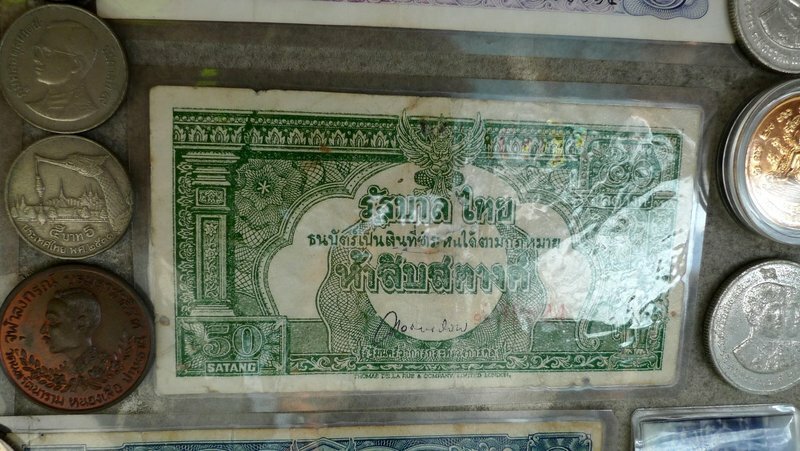 Vintage Thai currency! I want!! Wow! That is one of the coolest things I’ve ever seen! I have never seen such a thing –but it sure does make for an interesting ride! Have you blogged about this guy before because his taxi and the story sound really familiar. Nevertheless, it’s cool. He obviously takes pride in his job. Nice, I hope I get that taxi the next time I’m in Bangkok. ive totally been in that taxi before!